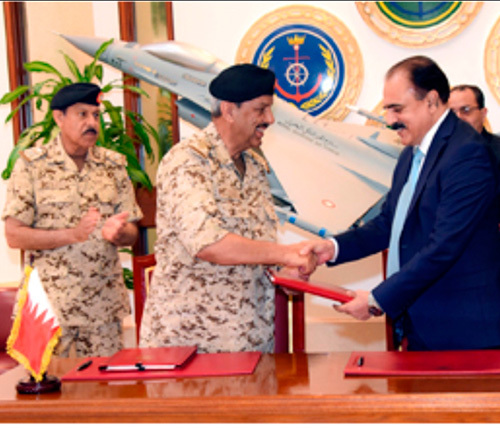 Commander-in-Chief of Bahrain Defense Force (BDF) Field Marshal Sheikh Khalifa bin Ahmed Al Khalifa signed with Pakistani Defense Secretary Zamir Ul Hassan Shah a joint defense cooperation agreement, Bahrain News Agency (BNA) reported. The BDF Commander-in-Chief expressed happiness about signing the agreement with Pakistan which will further boost bilateral military cooperation. He welcomed the Pakistani Defense Secretary, lauding distinguished relations of friendship between Bahrain and Pakistan and their perpetual growth in various fields. Both sides exchanged commemorative gifts. The signing of the agreement was attended by Defense Minister Lt. General Yusef bin Ahmed Al Jalahma, General Command Court Director Major General Hassan Mohammed Sa’ad, Acting Chief of Staff Major General Abdullah Hassan Al Nuaimi, Assistant Chief-of-Staff for catering and Supply Rear Admiral Yusef Ahmed Malallah, Military Cooperation Director Rear Admiral Mohammed Hashim Al Sadah and Assistant Chief-of-Staff for Operations Major General Ghanim Ibrahim Al Fadhala. Meanwhile, Bahrain’s Defense Minister Lieutenant General Yusef bin Ahmed Al Jalahma hosted a lunch banquet at the Bahrain Defense Force Officers Club in honor of Pakistani Defense Secretary Zamir Ul Hassan Shah. The banquet was attended by Defense Ministry Undersecretary Major General Sheikh Ahmed bin Mohammed Al Khalifa and senior BDF officers. The Pakistani Defense Secretary was mainly welcomed on arrival at Bahrain International Airport by the Defense Affairs Minister.